Ladies, gentlemen, and fishermen of all ages—this is your chapter update-newsletter for November 2017. Our Past President, Brian Winn, is improving but he is still experiencing medical problems that have left him with limited mobility and ability to carry out the duties of his office. He is in the Portland VA Hospital on the 9th floor, so if you are in the area and have some free time, he would enjoy a visit. We understand he has improved so much he may get a pass to come home for Thanksgiving. On Saturday, the Association held its Annual Banquet at the Wilsonville Holiday Inn. This event was well attended; the Salem Chapter had a table of 8 members in attendance. The association recognized veterans from all services. There was a presentation of our national and service flags by the local Boy Scout Troop. Several awards to chapters and members of the association for volunteer services were made. The keynote speaker was Mr. Brett Miller of Warfighter Outfitters Inc. of Sisters, OR. Mr. Miller is an Army Veteran recovering from his major wounds, loss of limbs, and he is dedicating his time by getting wounded veterans into fishing by taking them on outings. [We have his card if you would like to know more and maybe help him on his mission]. An auction for items, trips, and holidays was conducted to raise funds to continue the mission of restoring our Pacific Northwest fish runs and enhancing fishing opportunities for today and the next 50 years. Robert Morton won a “Go Pro” camera. December meeting and dinner is being planned by the Board. We will have the Association Executive Director Bob Rees. Bob is a guide and a very successful fisherman. The Chapter will provide the Ham and you will bring the side dishes. We will have a sign-up sheet to tell us what you will be bringing to the dinner at our next meeting. Suggestions are welcome. November Meeting will be on 21 November 2017. Our guest speaker will be local guide and fisherman, Matt Halseth. Matt has lots information about the Santiam River, local area, and coast fisheries. We will be raffling off a seat in his boat. Please see the flyer on the next page. Are you getting your Association magazine, The Northwest Steelheader, information from the association, and chapter e-mails? If you are not, please contact me. I think there are two listings at HQ. that may not be accurate. If you are getting this letter in the mail and have an e-mail address PLEASE save us money on paper, ink, stamps, and my time and provide us that information. Some e-mail I do send bounces back because of errors, or the box is full. I need a little help here. Hope to see you at the November meeting. Bob Johnston, Chapter Sec. Ladies, gentlemen, and fishermen of all ages: this is your chapter update-newsletter for October 2017. Our Past President, Brian Winn, is improving but still is experiencing medical problems that have left him with limited mobility and ability to carry out the duties of his office. He is in the Portland VA Hospital on the 9th floor, so if you are in the area and have some free time, he would enjoy a visit. We wish him a speedy recovery. Rod Ratzlaff is our new Vice President and a major contributor to the chapter. We must have active members to have a viable chapter. In my opinion, membership in an organization is more than just paying dues and attending an occasional meeting. Just now, our “past due membership” is larger than our “paid up membership.” Please help us by getting “your” membership up to date. We are still looking for someone to take on the duties of Chapter President. The Board of Directors will assist you in any way we can. We need new ideas and motivation. Our next meeting will be on 17 October 2017 at Keizer City Hall. The speaker will be Thom Kaffun (see flyer page 2). The Association “SHOT” Darby went well. You can see photos and stories at the Association Facebook page and they have added the upcoming Salem Chapter meeting to the ANWS calendar of events and to the ANWS Facebook page. 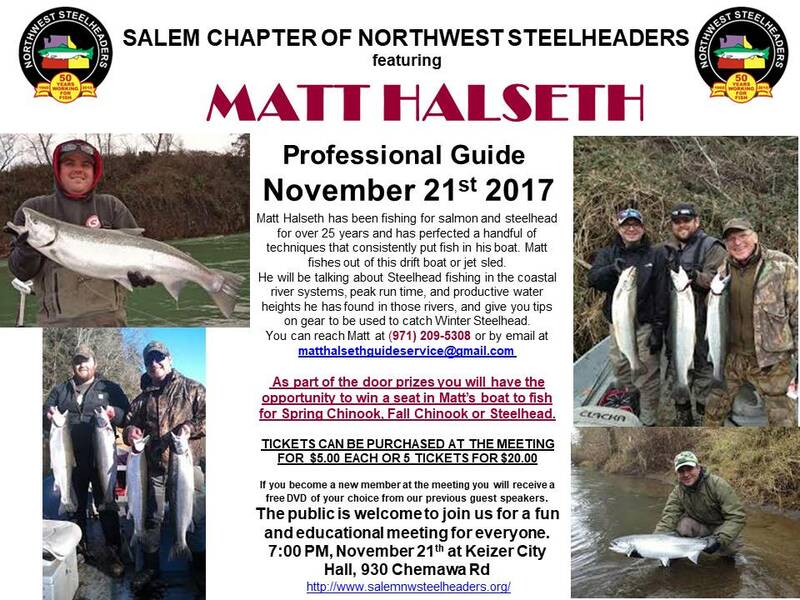 ODFW and Salem chapter will hold a Training Workshop outlining expectations and volunteer orientation on 18 October 2017 from 5:00-7:30pm and a Steelhead Fishing Workshop on 21 October 2017 from 7:00 am-5:00 pm at the North Santiam State Park. From Salem, take Rt. 22 east; just past mile post “26” you will turn Rt. into the street leading to the park. ODFW invites you to a Volunteer Training and Appreciation on 9 December 2017 at the ODFW Headquarters in Salem, Oregon from 11am until 2pm. More information will be available at the October meeting.